It’s UKIP all the way in Clacton. Being in the seaside town at the weekend was like arriving at party conference four weeks early: UKIP supporters flocked in from as far afield as Dundee and the atmosphere was celebratory. The overwhelming majority of residents in the town were delighted Douglas Carswell had joined UKIP because they were going to vote for the party anyway. Most of the rest were determined to stick with him for the forthcoming by-election because he’d helped them, a friend or neighbour, or someone in their family. Given some of the stories I heard, Douglas is clearly doing a great job in his constituency and very few voters are prepared to risk losing him. Only a handful I met said they were voting for someone else or couldn’t be bothered to talk about how Clacton came to find itself the centre of huge media attention. The staggering Survation poll putting UKIP on 64 percent (44 percent ahead of the Tories) exactly mirrors my own experience out canvassing. When the man himself appeared on the High Street in Walton-on-the-Naze with Nigel Farage, cars hooted their horns, drivers waved and cheered, pedestrians clamoured to stop and talk to them both. It was like Carnival had landed. Both men told me later – independently – how impressed each was with the obvious popularity of the other. If his experience is anything like mine when I defected from the Tories in May last year, Douglas Carswell won’t regret his decision for a moment. I could empathise when he expressed on Twitter how sad he was to “read one or two unkind comments by one or two former colleagues,” but I can also assure him he will find enough love and support here in UKIP to counteract that. 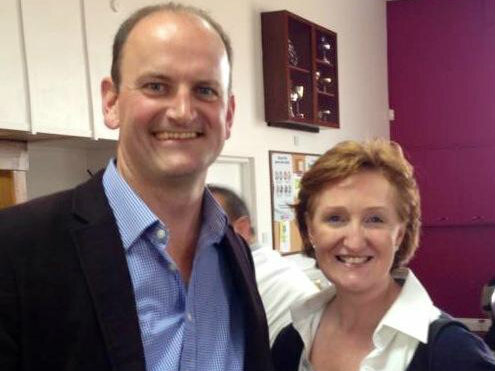 As Nigel Farage said, Douglas Carswell is a perfect fit for UKIP. I hope, like me, he will soon feel that in joining UKIP he has ‘arrived home.’ His bombshell speech on Thursday certainly suggests he will. He revealed the truth of what UKIP has long been saying: Cameron’s referendum promise is a sham; the three old parties will say anything to get or stay in power and then drop their promises like hot cakes the moment the elections are over. Significantly Carswell blew apart the myth that there’s much difference between the old parties – “same clique, different sofa” got the point across perfectly. There was so much hope in 2010 that the Tories would put right Labour’s thirteen years in Government, years that proved to be so catastrophically disastrous for Britain, socially and economically. Yet they too fed us a string of broken promises: the great ‘Reform’ bill to wash away the swathes of red tape and new legislation introduced by Labour? It didn’t happen. Parliamentary recall? What a joke. “We will cut the national debt.” Please! It’s set to be 50 percent higher by 2015! I was personally most enthused about the concept of localism but that too was a deceitful invention. Almost every day now in the Shrewsbury and Atcham constituency where I’ll be standing for parliament, UKIP gets requests from furious locals to help campaign against a new, ill-thought out, unnecessary housing development on precious agricultural land. The days of the Tories being the party of the countryside are long gone. Only the top down re-organisation of the NHS that nobody wanted and which we were assured wouldn’t happen, actually happened, at vast cost and with vast consequences. UKIP’s stance on the EU and controlling all migration, not just non-EU migration is well known, but we have a whole raft more policies, many of which will be unveiled over the next few weeks. Significantly though, a UKIP Government would look very different to the one Douglas Carswell has been so critical of this week: it would be much smaller and far more cost-effective – both the size and cost of Government departments would be slashed. We would scrap some altogether. Significantly there would be a real power of recall for MPs, where constituents get the final say, not other MPs. UKIP genuinely does want real change and a Parliament that is accountable to the people and a servant of the people, not the other way around. The determination to reform Parliament is a key factor that drives UKIP and it’s a strong differentiator between ‘us’ and ‘them.’ Both supporters and elected politicians in UKIP have guts; they do what they say they will, no shilly-shallying or woolly-wobbling. You’ll find none of that here Douglas; we put people first, not pollsters. Welcome to UKIP, to the home of conviction politics. It’s great to have you in the ranks and thank you for helping fire up our political revolution.